I hope you are enjoying your weekend so far!! 🙂 Mine has been full of fun! I am taking today off to do NOTHING! I need a day of total relaxation. Last night was a great time with friends..I enjoyed fried pickles and a few drinks. Ever had fried pickles? They are really good! Yum! 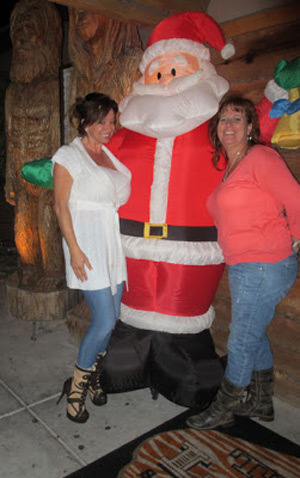 Here is a pic of me and Dawn loving Santa. hehe! Have a super Sunday! ENJOY! Quality time with my babies!